Pine Allee trail © Tree Specialists Inc. The JRCF has become an integral part to a public/private partnership with the Town of Belmont and the Land Management Committee (LMC) to assist in the care of 88 acres of public open space on Belmont Hill. In 2011 this land was formally named Lone Tree Hill: Belmont Conservation Land. Formerly owned by McLean Hospital, the land has wonderful and diverse habitats, ranging from hardwood forest and Pine Allee, to meadows and vernal pools. The Town of Belmont is now the steward of this land, but pubic funds are limited for its needed rehabilitation, preservation, and maintenance. Experience the meadows and woodlands right here in Belmont and along the Western Greenway. Below are various maps to help guide you. Click on the list items below to download a pdf map of that area. There are five public access points to the Belmont Conservation Land at Lone Tree Hill (see Lone Tree Hill Trails Map). There is a parking lot on Mill Street—across the street and not far from the Rock Meadow parking lot—for access to this land. Visitors to the property are encouraged to walk or bike to the site as able, and Wheelworks donated a bike rack for the Mill Street lot. If driving, in addition to Mill Street, visitors are encouraged to find legal parking in the vicinity of Highland Meadow Cemetery at Somerset Street and Concord Avenue, or Pleasant Street near Shaw’s Market. This land is managed by the Town of Belmont for conservation and passive recreation. Please observe all Open Space Rules (below) when visiting. Abiding by these rules helps ensure the safety of visitors and protects the land and resident wildlife. Violators may be subject to fines per the General By-Laws of the Town of Belmont. NO...motorized vehicles, dumping, fires, alcohol, smoking, hunting, camping, or ball playing/other active recreation. In case of emergency, call 911. In case of an animal related problem, call 617 993- 2724. Olmstead recommended the site in Belmont “for its great number of well grown trees on wooded land, the rocky sterile and arid surface for building and the strongly contrasting elements of landscape interest.” [Quoted in Betts, Footsteps Through Belmont]. In 1875, the hospital bought 114 acres from the Waverley Land Company at what was then called “Wellington Hill,” and started construction in about 1892. The hospital opened its Belmont campus in 1895. Over the years, more land was acquired until McLean’s campus totaled 240 acres. 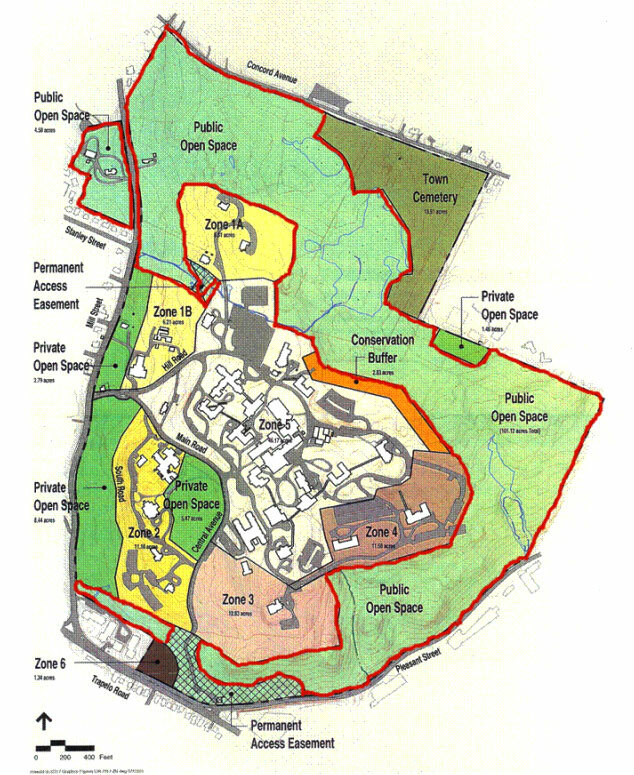 One hundred years later, in 1995, McLean decided to down-size its campus and began negotiations with the Town for rezoning to enable building development. After four years of hard work by many town committees and concerned citizens, the rezoning was passed by Town Meeting in 1999. To learn more about the History of McLean Hospital, visit McLean Hospital: History from Charlestown to Belmont, Mass at the hospital’s website.